Maybe it’s a rebellious streak, though. After years of people telling me “but you HAVE to label your quilts,” I just don’t. So there. It’s silly, I know, but up until a couple of years ago, I just felt that labels were something I just added on at the end. It really didn’t strike me as an opportunity to add to the design. 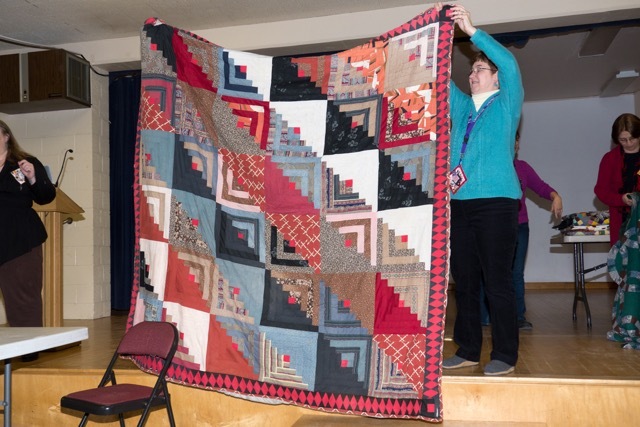 And then I had to take a bunch of my quilts to my Guild for a “Member Spotlight,” and I knew that I was going to get grief for not having labeled my quilts. So, I decided to improvise and make some “fancy” quilt labels. Googling “free quilt labels” got me the same old, same old. Some were nice, but none were inspirational. So, I combed free clip art sites and noticed that the designs that attracted me were bookplates. The big problem with using images off of the web is you have to make sure that you are using royalty-free, and not someone’s artwork. 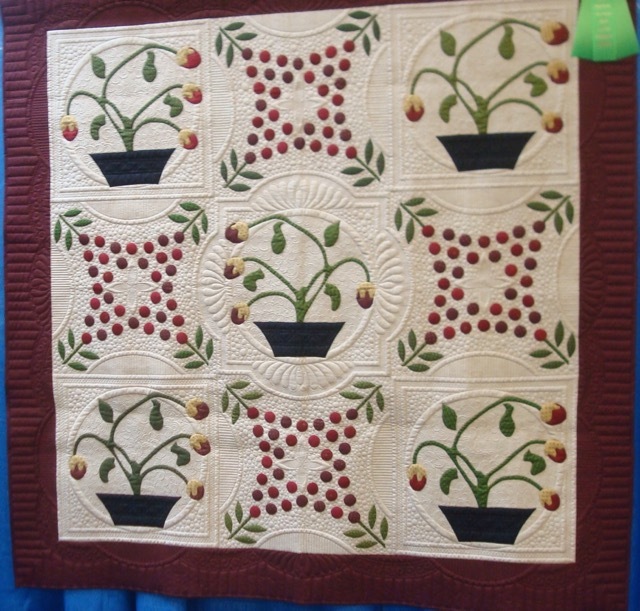 If you do find a piece of art you’d like to adapt to a quilt label, just email the artist and explain what you want to do. They might say “no” but they “yes,” or that you have to put a copyright info next to the artwork on the label itself. I like vintage art, so most of the designs I choose are in the public domain, but a scan of the actual image may not be, so that requires a little more research if I fall in love with an image. After I find the image (and get the necessary permission, if I have to), I create the label. I use Photoshop Elements, but any application that allows you to layer text over images (or move it around along side the image, or whatever) will do. 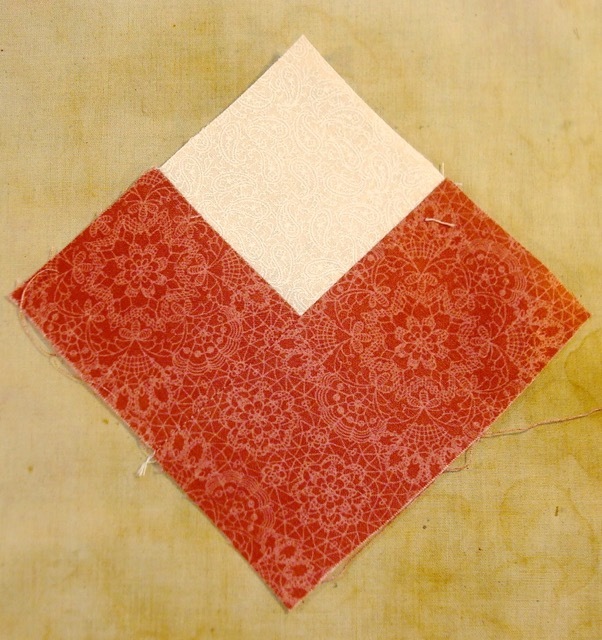 Then, I print my labels on muslin using something like Bubble Jet Set, stitch them on to the quilt, and, voila! It’s not as painful as stitching down a binding by hand, so I don’t really have an excuse when I’ve made it that far. It’s not every day you get to name an actually living being so I have to settle for naming quilts. Once upon a time I was going to rewrite T.S. Eliot’s “The Naming of Cats” to reflect the naming of quilts. I didn’t get far because it’s easier for me to work on “filk” with other people around and these days I don’t work in an office. Anyway, since writing about my Guild’s upcoming Quilt Show, I read some of the comments and got to thinking about that topic again. My mother (and other people) seem to really like the names I come up with for my quilts and always want to know how I think them up. Detail of Spirographology taken by Jeff Lomicka at my Guild talk. For instance: Spirographology. 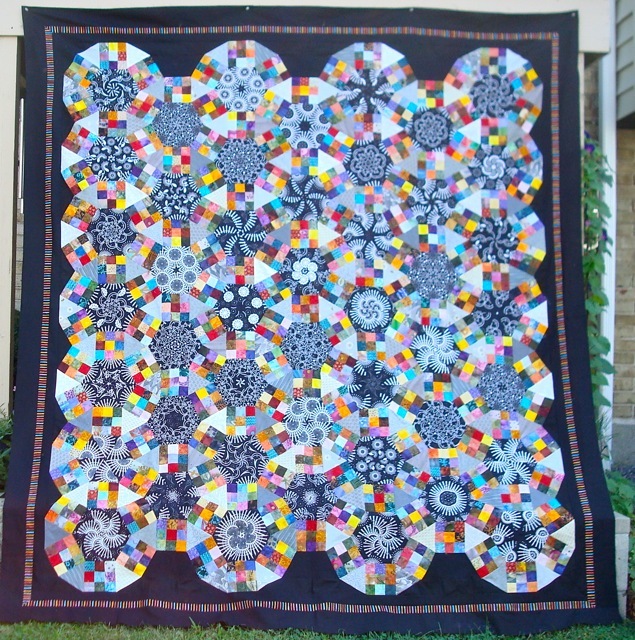 I had bought the black and white fabric in the centers of what came to be the Jack’s Chain specifically to do a “stack n whack” kind of quilt. I had fun working on the other two I had made, so I thought this would be a quick, fun project. 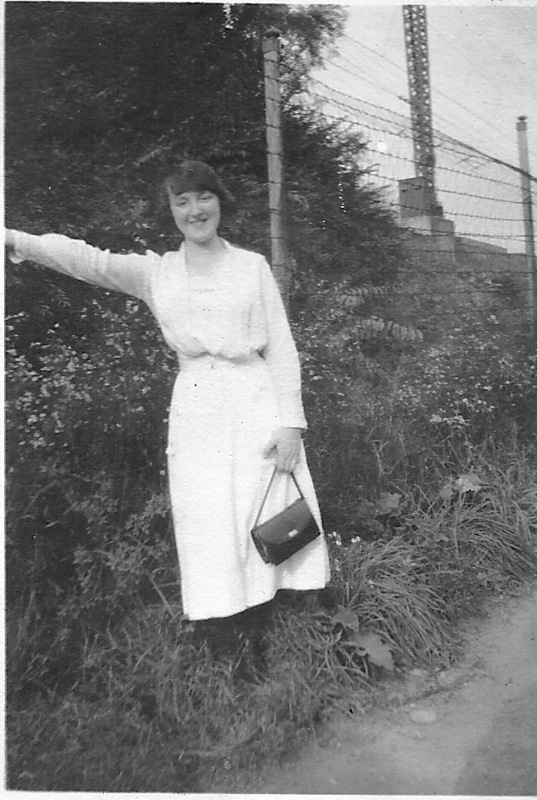 But it didn’t work out that way since, with just the black & white fabric, I thought it was dull. I didn’t like it. I sent a picture to my mom, and my dad saw it and said that they looked like something I made from a Spirograph. That stuck with me and, as I was assembling the Jack’s Chain, I eventually decided would “spice up” the monochromatic stack n whack, I came up with the name Spirographology. 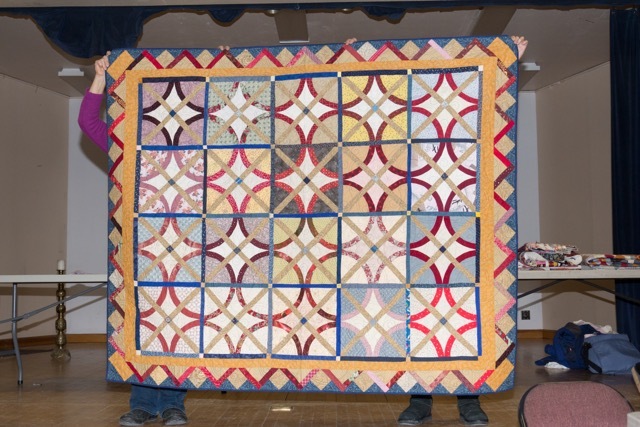 The Road from Malden to Lowell is Paved With Broken Dishes… is probably the longest name I’ve ever named a quilt. 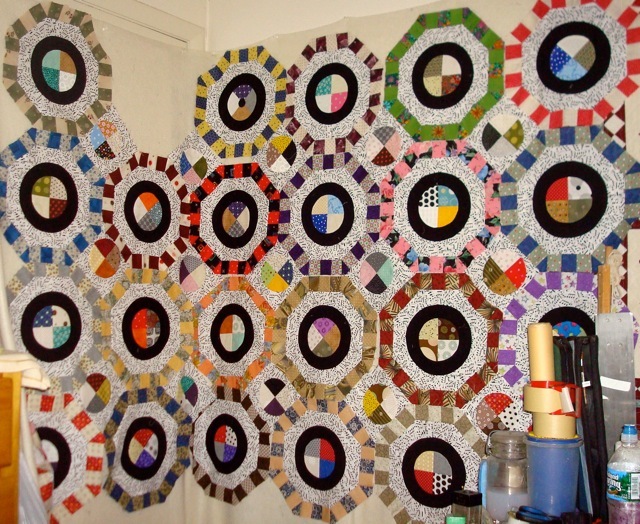 So, as you can see, I usually change the name of a quilt as I work on it. 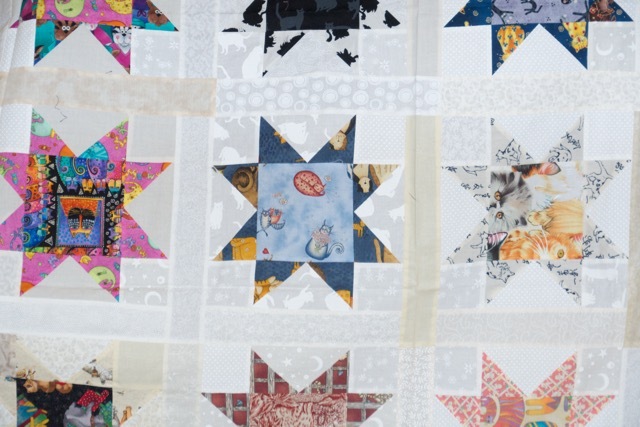 I start out most times with the name of the block and sometimes I keep fairly closely to name, as in the case of the broken dishes quilt that I was working on it when I moved from Malden to Lowell. 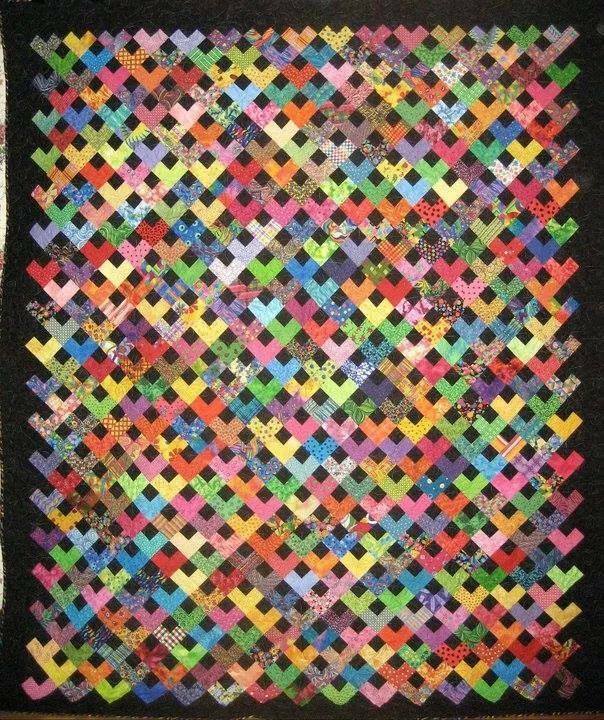 Learning Curve is one of my favorite quilts. I knew I shouldn’t call it “Baltimore Album” because I’ve never lived in Baltimore, and not even all the blocks are from Baltimore. 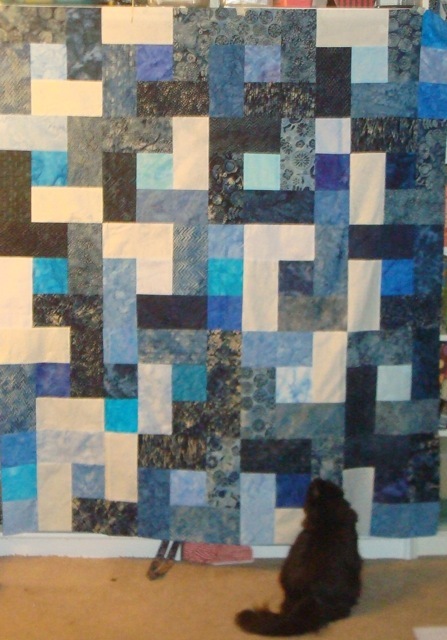 In the end, I did decide to use the early blocks, and felt that this way the quilt really shows my learning progress, so I named it Learning Curve. My current machine piecing project is Suburbia. I started out calling it “9-Patch Houses”, but when I got them all together I thought about where I grew up and how here were 4-5 different house layouts/designs in our “housing plan.” We all started out looking similar, but, after a while, our houses were all different because of doors, shutters and landscaping. 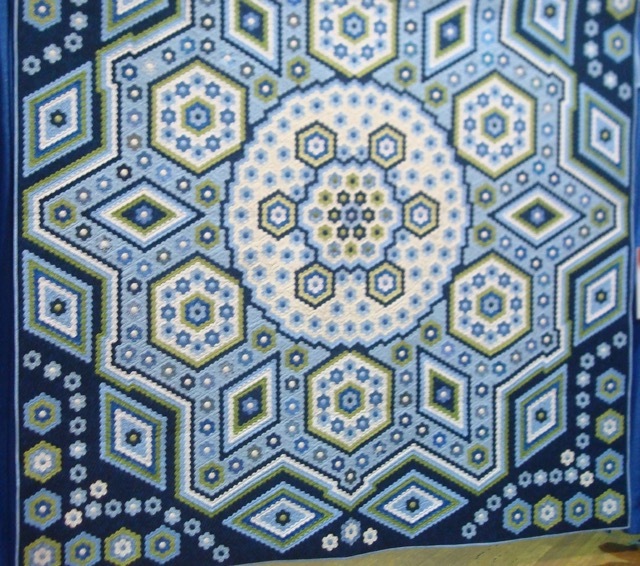 The houses on my quilt are the same because they start off with a 9-patch, but, like my neighborhood, they ended up looking a bit different because of the fabrics used. 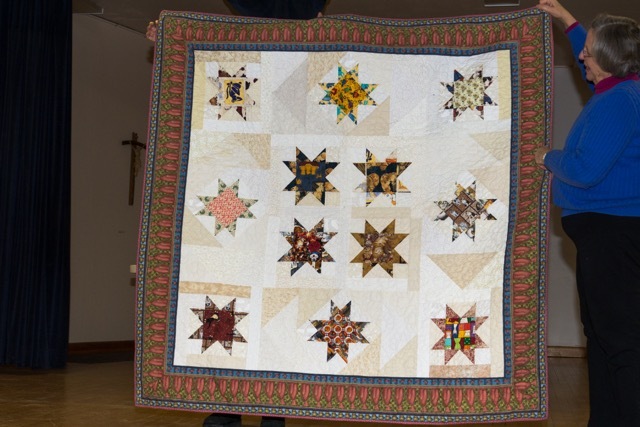 If you have read this blog for a while, I sometimes talk about how the names of my various quilts come to be. 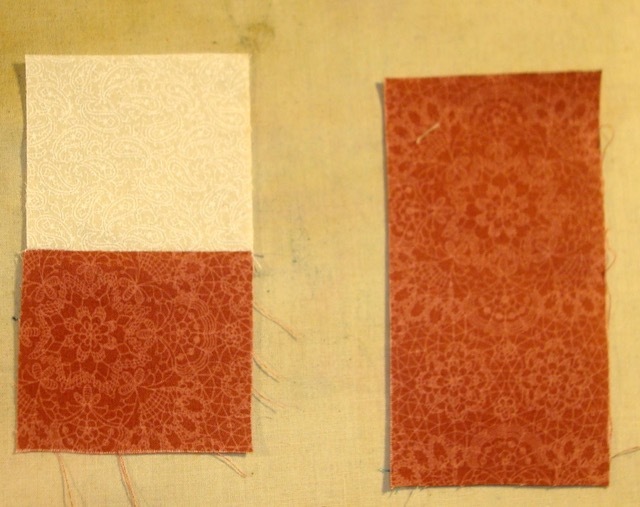 I will, of course, continue to share this on the quilts as I’m working on them, but I hope this post gives you a little insight on how I do it if you don’t want to go back and read my old posts. As you know (if you’ve been reading my blog, hanging with me on Facebook or if you haven’t dodged fast enough when you saw me in person), I’ve working on Sunflower Lattice for a while. Well, I’ll tell you a secret. There ARE no inset seams in Sunflower Lattice. 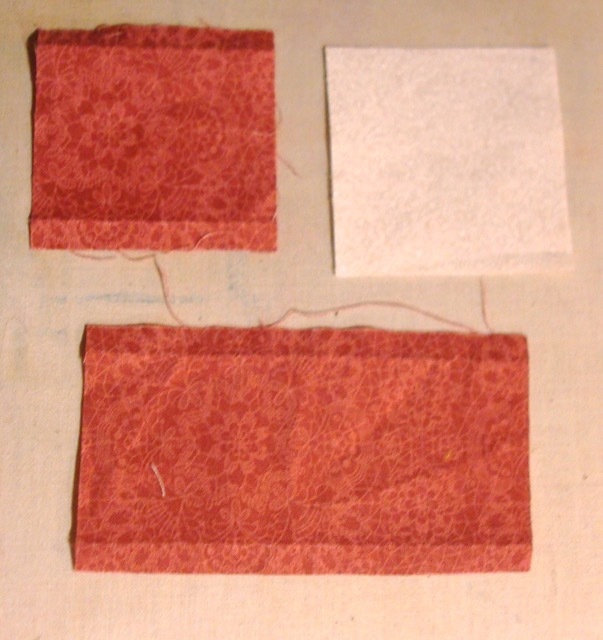 I was not in any mood for inset seams, so I specifically went looking for a construction method didn’t require them. It turns out that hexagons are made up of equilateral triangles. and if you add 3 equilateral triangles to the edges of a hexagon you end up with…a bigger equilateral triangle. Then, you can assemble hexagons-within-triangles to other hexagons-within-triangles simply by rotating them. This is how I formed the rows. Now, an alternative to putting together hexagons is if you attach 2 equilateral triangles to opposite sides of it. In that case, you end up with a diamond, which you can sew in a row without rotating them. Stars for Malcolm also uses hexagons. 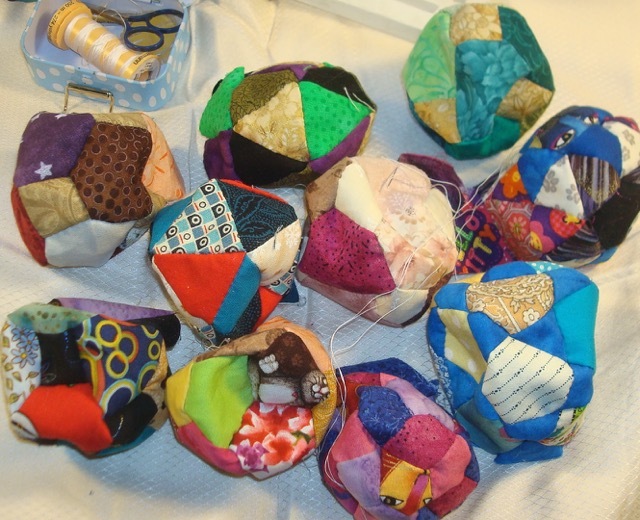 I will be sewing two triangles to opposite sides of the hexagons to make diamonds and then sew the diamonds into rows. The problem, of course, that the length of the side of triangles you need are the same as the length of a side of your hexagons. And most commercial templates and rulers, these are usually calibrated using the HEIGHT of the triangle. The problem is, of course, that there’s no simple way to convert from the length of a side to the height of a triangle. For that you need math and sines and a calculator, and… oh I see your eyes are glazing over. Let me make it easier for you. If you want to use commercial templates and rulers, these are use the HEIGHT of the triangle. The sides will be longer, but you don’t need to know their dimension as long as you consistently use the HEIGHT for all your measurements. 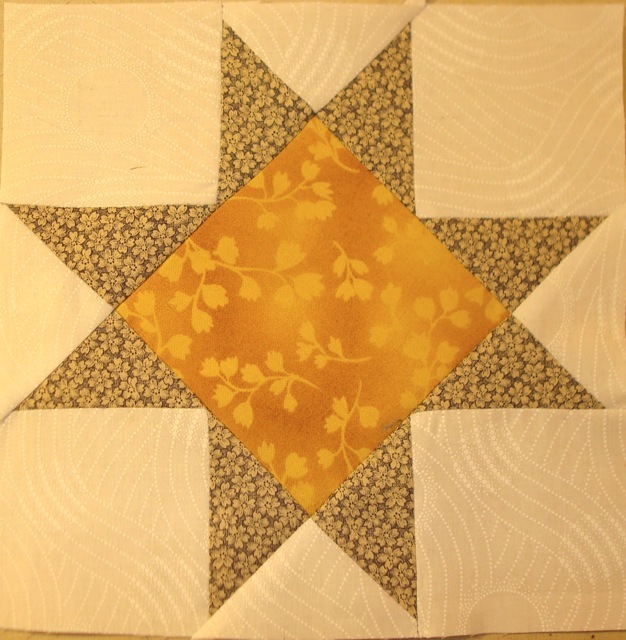 For instance, let’s say I wanted to cut the triangles in between the Seven Sisters blocks in Stars for Malcolm. So, it’s easier to calculate the dimension I need based on the height of the hexagon, in this case, by counting the rows of diamonds. I start at the upper right corner and count straight down. If I counted all the rows, there would be 10. and I know the diamonds finish at 1″. I needed to know the length of a side of the hexagons in Spirographology so I could make the 9-patches fit. 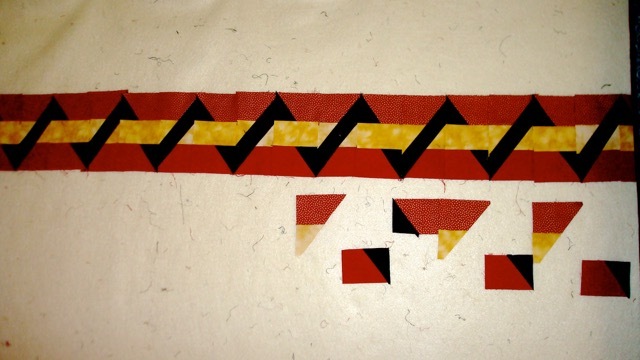 Since the triangles I want will be half the height of the hexagons, they will finish at 5″, and, adding in the seam allowance, I will need to cut the fabric in a 5.5″ row. 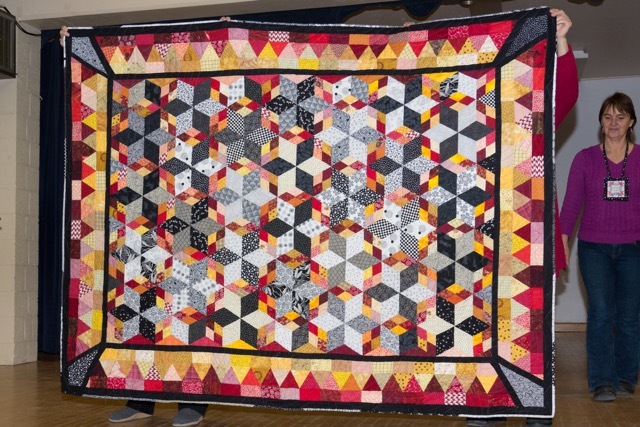 Now, if I wanted to cut out the triangles by the length of the side, my brain would explode, because all my measurements in this quilt are based on height, but in Spirographology, I had the opposite problem. 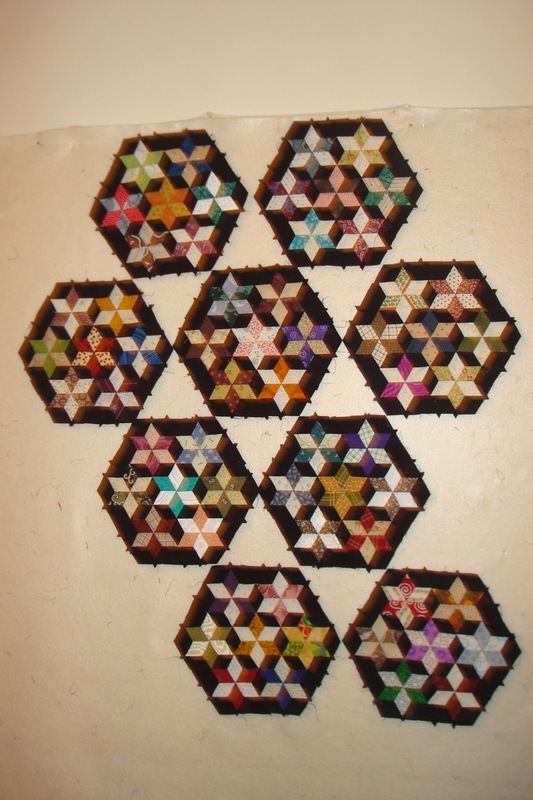 The side of the hexagons needed to be the same size as the 9-patches. I couldn’t use a standard ruler to make the triangles, so I ended up using templates. It took a while to figure out what WHY the rulers didn’t work, but now I know: be consistent! Use the side measurements or use the height measurements, but don’t interchange them! This week I folded up my design wall. I have very limited space in my apartment, so my “design wall” is actually a 3 yd x 72″ piece of felt I bought at JoAnn Fabrics with a 50% off coupon. Usually I keep it folded in half and pinned to my bedroom wall behind the door, but Spirographology and Oldies were both so big, I needed to unfold it so I could see what I was doing. When I do that, I pin the felt to the back of my door. 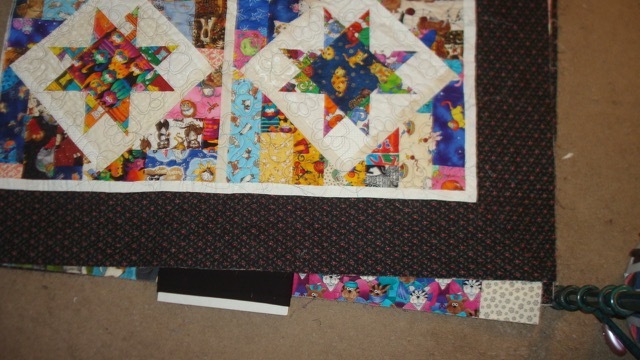 When the door is closed I can see the whole quilt, and when it’s open, my project is out of the way. 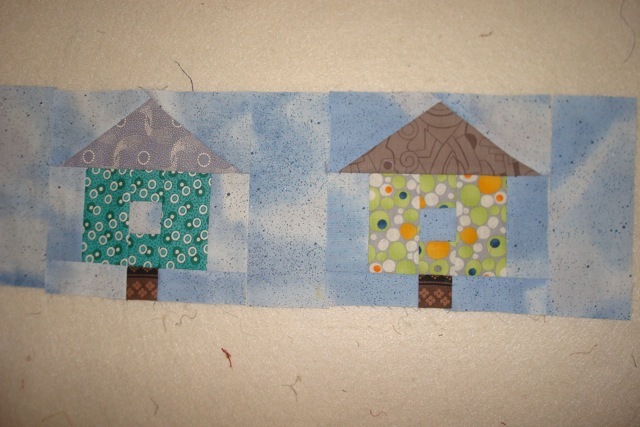 These bird house blocks are intended to start a Row Robin with my quilt guild. 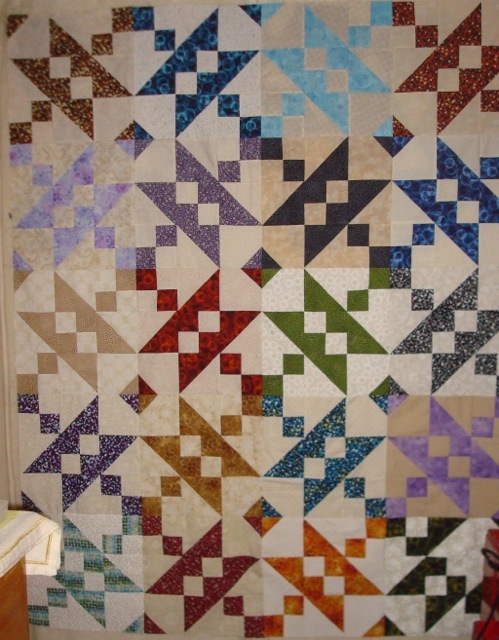 Now that Oldies needs only one more “seam” to have the central part done (I seldom design borders using the design wall), I have decided to indulge in small projects for the rest of the year. 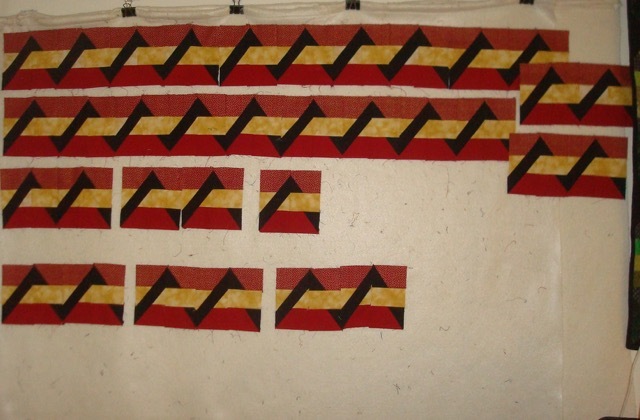 The first project is to finish my initial row for my Guild’s Row Robin, due in a couple of weeks. I decided on the theme of “In My Backyard” and started out with a row of birdhouses. 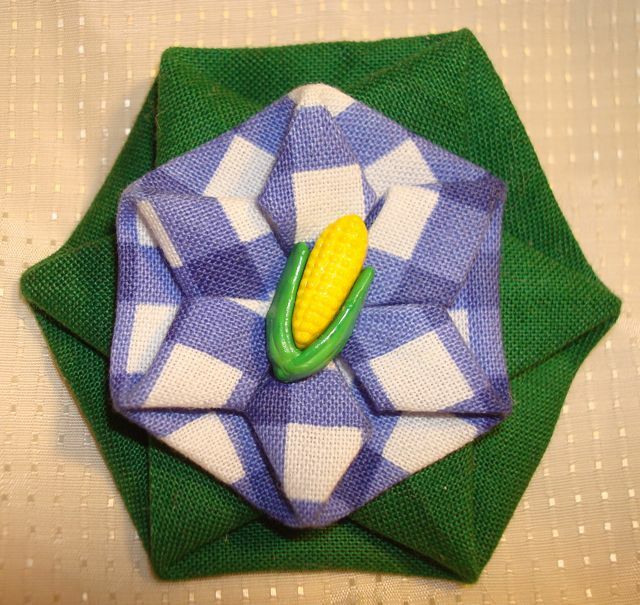 I made this “harvest” barrett after receiving a bunch of buttons, one of which was this ear of corn. 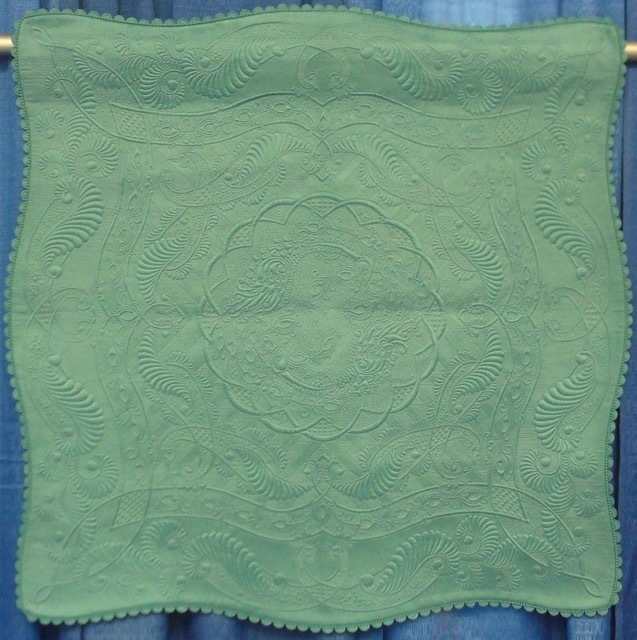 The “biggest” small project I’m looking forward to is some placemats I’m making for my mother. These are going to have circles all over them of different sizes and kinds. She wants 6 of them. I am planning on making them all different. I also have kanzashi to make. I will be selling these at a craft show I’ve signed up for in December along with my regular jewelry and the folded hexagon flowers I had last year. I will use both cotton and silk for these since you can’t really wash them anyway. This is me, clearing “the decks” to actually quilt in the winter months. I hope to finish Spring Fling, start My Heart is in the Work (which I will be hand-quilting, so don’t expect it to be completed this year. After all, I am not Tim.) 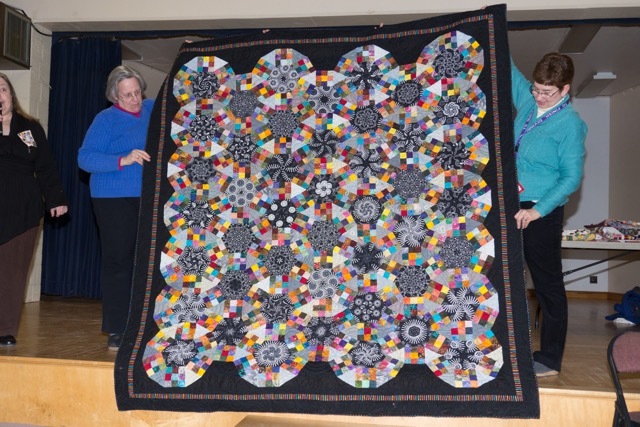 and, maybe, one or more other quilts, if I can appease the Long Arm Goddess. 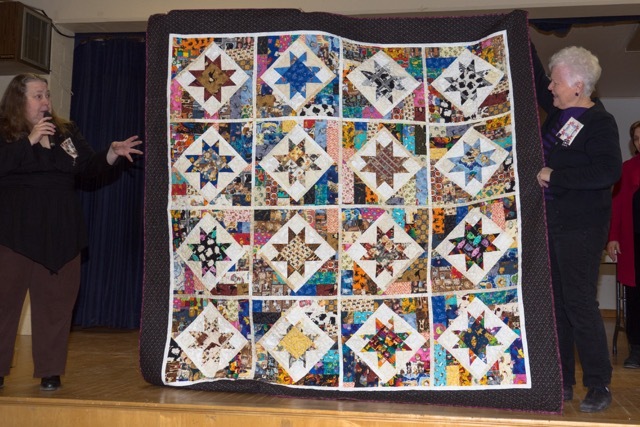 It’s going to be a cold winter and I think I’ll need more quilts to keep me warm!